Shepherd J, et al. Pravastatin in elderly individuals at risk of vascular disease (PROSPER): A randomised controlled trial. Lancet 2002;360:1623-30. Bottom-line: In elderly patients with at least 1 additional CV risk factor or existing CVD, statin therapy reduces the risk of CV death, MI or stroke (NNT 48) over 3.2 years. As in other scenarios, the absolute benefit of statins depends on the underlying risk for CVD events, as well as competing causes of morbidity & mortality. Heart Protection Study Collaborative Group. MRC/BHF Heart Protection Study of cholesterol lowering with simvastatin in 20 536 high-risk individuals: A randomised placebo controlled trial. Lancet 2002;360:7-22. Bottom-line: In patients with existing CVD or diabetes, statin therapy reduced the risk of death (NNT 56) & all major vascular events (NNT 19) over 5 years. In this population that initially tolerated simvastatin during a 4-6 week run-in phase & was not taking other lipid-lowering therapy, moderate-dose simvastatin did not increase the risk of cancer, cognitive impairment, liver enzyme abnormalities, myalgias or myopathy. In patients with CAD, high-dose statin therapy vs low/moderate statin doses further reduces the risk of CV events by an ~15% (relative risk reduction). In Japanese patients with CAD, moderate-dose statin reduces the risk of CV events and death versus a very low dose by ~19% (relative risk reduction). de Lemos JA, et al. Early intensive vs a delayed conservative simvastatin strategy in patients with acute coronary syndromes: Phase Z of the A to Z Trial. JAMA 2004;292:1307-16. Cannon CP, et al. Intensive versus moderate lipid lowering with statins after acute coronary syndromes. N Engl J Med 2004;350:1495-504. Pedersen TR, et al. 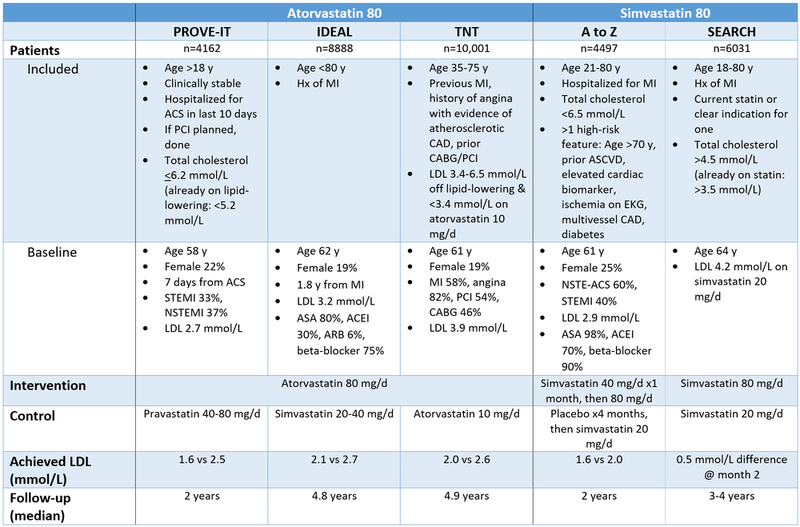 High-dose atorvastatin vs usual-dose simvastatin for secondary prevention after myocardial infarction: The IDEAL study: A randomized controlled trial. JAMA 2005;294:2437-45. LaRosa JC, et al. Intensive lipid lowering with atorvastatin in patients with stable coronary disease. N Engl J Med 2005;352:1425-35. SEARCH Collaborative Group. Intensive lowering of LDL cholesterol with 80 mg versus 20 mg simvastatin dialy in 12 064 survivors of myocardial infarction: A double-blind randomised trial. Lancet 2010;376:1658-69. Taguchi I, et al. High-dose versus low-dose pitavastatin in Japanese patients with stable coronary artery disease (REAL-CAD): a randomized superiority trial. Circulation 2018;137:1997-2009.